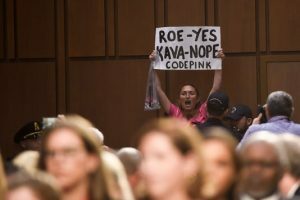 The ongoing assault on Justice Brett Kavanaugh highlights a concerted and dangerous intentional effort by the Marxist and Islamic counter-states operating inside the U.S. like dueling cancers to destroy us from within. This war is primarily being waged in the information realm and the enemy’s tools include propaganda, subversion, influence operations, political warfare, and similar lines of operation to intentionally undermine the Republic and bring it down from the inside. This means those people engaged in this cannot be considered “nice” people with “differing opinions.” They are hostile to our legal and political systems and are waging a systematic assault on our founding principles and our way of life. Working in tandem, the Marxist and Islamic counter-states oppose everything that provides a foundation and protection for the United States. It is the Marxists, led by the leadership of the Democrat party, who opposed President Trump in his desire to shut down immigration from nations hostile to America. Collaborating with their terrorist/jihadi allies from the Muslim Brotherhood’s Muslim Association of Hawaii and a federal judge, Democrats (Marxists) thwarted the President of the United States in this efforts to protect the American people. Have you wondered by President Trump’s effort to designate the Muslim Brotherhood a Foreign Terrorist Organization has failed thus far? The leadership of the International Muslim Brotherhood’s admitted in February 2017 to a coordinated information operation directed against the U.S. Congress and the American people assisted by Hillary Clinton and the Clinton Foundation’s Director in Egypt, Gehad El-Haddad. 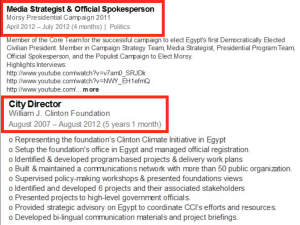 El-Haddad was the Egyptian Director for the Clinton Foundation from August 2007 through August 2012. Gehad El-Haddad is also the jailed Spokesman for the International Muslim Brotherhood and was the spokesman for the Muslim Brotherhood’s candidate who became Egyptian President Morsi. Just like the “nuclear freeze protests” of the 1980’s – which were funded by the KGB and their communist surrogates all over the world – the events unfolding today are being coordinated and intentionally executed by individuals and organizations hostile to the United States with the purpose of bringing America down. This means these individuals and organizations are waging war against the United States and, therefore, should be not be considered “political opponents” but hostile entities in a war for the survival of the Republic. When the Mufti of Jerusalem absconded from Palestine to Berlin during WW-Ii to avoid service of a British arrest warrant for fomenting riots, he was not only assured of the refuge he sought by the German Fuhrer himself, but also became an alacritous recruiter of sharia-adherent Bosnian Muslims to serve in the Handschar Mountain Division of the waffen SS, as well as a protégé of Heinrich Himmler, the widely reputed successor to Hitler. Heinrich Himmler was the neo-pagan* Nazi who lived but 44.625 years, though by age 36 not only headed Germany’s secret state police (the Gestapo) but had also founded — thus controlled — the so-called “Third Reich’s” infamous European chain of concentration camps I.e.. grotesque campuses of unspeakable horror created for the express purpose of literally industrializing the mass murders of millions. And a beast from whom said “Mufti of Jerusalem” immediately sought private tutorials on the methods, and equipment etcetera to replicate said holocaust crimes after the war. I.e., with respect to UTT’s foregoing customarily-comprehensive & timely revelations, its important to note that although Himmler indeed prioritized the annihilation of communists and Jews, his end game (after 14-centuries of “incompetent” trying by Islam) was to finally have an unimpeded shot at the obliteration of Christianity, since what he, i.e.,the Nazi “master race” provocateurs (both then & now) feared most was the unique power of undying compassion for humanity, I.e., the eternal essence of Christian beliefs. All of which (with but a dearth of noble exceptions) is happening right now at the hands of the Muslim Brotherhood and other embedded anarchical frauds. *Anyone wishing to garner a comprehensive and cogent understanding of what a declaration of war against their families and their country actually looks like and says, can order (for a nominal handling & postage fee) an Arabic-to-English verbatim translated copy of precisely that document; the original of which was seized by Special Agents of the FBI from a subterranean basement in Annandale, Virginia in 2004 in accordance with a federal search warrant, I.e., contact http://www.securefreedom.org to request: GOVERNMENT EXHIBIT 003-0085 3:04-CR-240-G U.S. v. HLF, ET AL.